It gets hard to clean a baby’s room when the baby is sleeping ALL THE TIME. When baby isn’t sleeping, baby needs you to feed her, hold her, bathe her, dress her, and play with her. So it can be tricky. Baby’s room seems to go one of two ways–it stays insanely organized because there isn’t much activity going on in it, or it gets cluttered and messy because you can’t find the time to get in there and clean it. 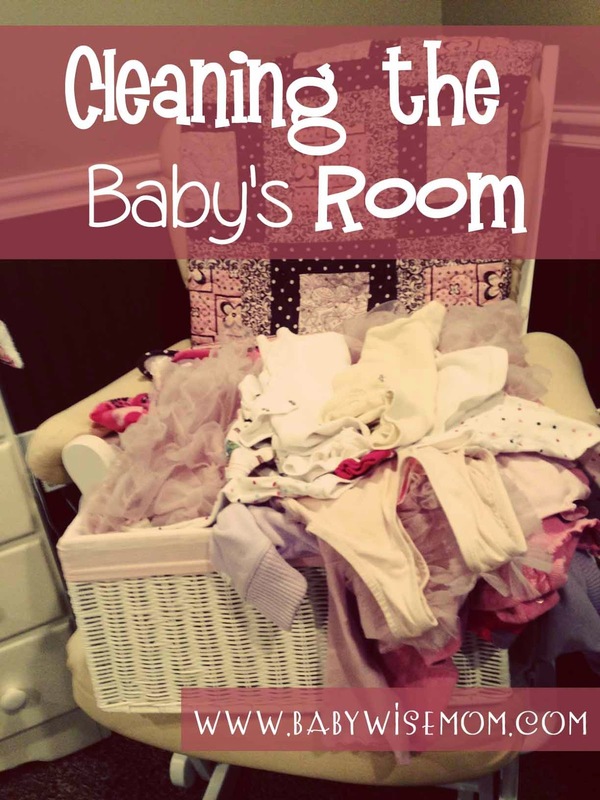 I have some strategies for keeping baby’s room clean and organized even while baby is occupying it so often. If you are going to make the most of your 5 minutes here and 10 minutes there, you have to have a battle plan in place. Otherwise you will spend half of that time deciding what to do. I correlate what I am doing with the rest of the house that day. So if it is laundry day, then I plan to put the laundry away at my next chance. I put the basket of clean clothes right outside the door. Then when the baby is awake (or it is time to be awake), it is go time! Whether you plan to dust, vacuum, or organize, have a plan before it is time and have your supplies ready. Think through your baby’s routine and decide when it would make the most sense to try to work it in. If your baby is the type you have to wake up from naps, go in at the end of a nap and hurry and do some cleaning right before your baby is suppose to wake up. When Brinley was a young baby, I would start vacuuming my house a little before her morning nap was supposed to end. Her room was the last on my vacuuming tour. I would go in and vacuum. If it woke her up, she would just lay there watching me while I hurried and did the room. Here are some times when I do cleaning–these are just examples. You can look at these and find something that works for you or it might spark and idea that works for you. Right at the end of a nap. You can talk to your baby if she wakes up while you are in there. A bonus of doing this is that the baby learns it is okay to wake up and stay in the bed for a bit. During Independent Playtime. With young babies, I do independent play at the floor gym with me in the room. The baby doesn’t have good enough eye sight when young to be following you around. I would do some quick cleaning during this time. During Tummy Time. I have a hard time not interfering with my babies when they are struggling. If I give myself a task to do, then it allows the baby to work at rolling over and exercising those muscles before I swoop in and save the day. During Free Play. No matter the age of your baby, you can lay or set your baby on the floor in the room and have your child play while you do something. During Blanket Time. Blanket time is another great time that you have to do some cleaning. At the end of playtime. Right now, I often go in the room at the end of Independent play and do some cleaning. We are both already there. Right before nap or bedtime. Go into the room 5-10 minutes early and do some cleaning right before the nap or bedtime. During Naptime. When Kaitlyn was a baby, I had her take a couple of naps a day in my room each day. I could get some cleaning done in her room when she was napping in mine. In the Evening. You might find it works to have your spouse take the baby for some playtime while you do some cleaning in the room. Once you start the cleaning, you need to move quickly. Move fast. You have to accept your opportunities you have. You might not get it all done in one chunk. I find this to be especially true when I am going through clothes. Babies outgrow clothes quickly, and when I am going through the closet to get out the clothes that are too small, it will take me several days of doing quick cleaning to get it done (by the way, a trick I have here is to just pull clothes that are too small as I am doing laundry. When I fold something too small for any of my kids, I set it aside and move it to the storage room later). Some tasks can be make simpler just by how you organize it. Laundry is faster to put away the fewer clothes you have hanging on hangers. Fold what you can and put in drawers, on shelves, and in bins. This will enable you to put the laundry away in 5 minutes flat. Are you the type of cook who cleans as you go or who cleans when you are all done? I am a clean as you go type in everything. I have never had an issue with a baby’s room getting messy, so it surprised me the first time I ever heard a mom talk about it. I have noticed over the years there are many who find it a challenge. If you clean things as you go, it will stay at least picked up and clutter free. It is like the tortoise. Slow and steady. If you get out the lotion, put the lotion right away. If you have some diapers to put away, do it. This works well for a baby’s room because you only have a few minutes here and there. Use those minutes to keep things in order. Today is our BFBN Pinterest Day–check out the other ladies blogs in the BFBN today for more fun cleaning tips. Check out our joint Pinterest account for all of our favorite cleaning tips. In caring for my babies I definitely found that the more organized I was the easier it was to keep up with their care. With a little efficiency the need for deep cleaning and constant upkeep is almost eliminated.